At Electrical Connection, we are proud to offer quality electrical services to customers throughout Connecticut. We provide electrical installations, upgrades, maintenance, and 24-hour repairs. If it is electrical, we do it...small repairs to full installs: Repairs - Upgrades - Rewiring - Indoor and Outdoor Lighting, Pool & Hot Tub Connections - New Outlets - Ceiling Fans - Data Communications Lines - Fuse & Panel Box Repairs and Upgrades. We specialize in automatic standby generator installs, service upgrades, and electric vehicle charging stations. We care about helping our customers save energy and lower their electric bills with a variety of electrical upgrades and home energy systems. For new home construction, Electrical Connection is one of the largest service providers for wiring new homes. We hire only licensed electricians. So you can rest assured that your home's electrical wiring is safe and up-to-code. We also provide routine maintenance and electrical repair services any time you need us. We are a licensed Generac dealer, providing sales and sevice for whole house generators. We also provide an automatic standby generator maintenance plan that includes checking the oil, battery and engine maintenance, fuel pressure tests and safety check-ups as well as all manufacturer-recommended annual maintenance services. We offer 1 and 2-year maintenance agreements. Call us for more details. The qualified electricians at Electrical Connection have extensive experience in the commercial and industrial fields. From routine service calls and office renovations to design-build services for a new commercial building, we have all the necessary skills to complete your project on time and within your budget. Here at Electrical Connection, no job is 100% complete until our customers are 100% satisfied! We’d like to know how we can brighten your day with one of our comprehensive electrical services. 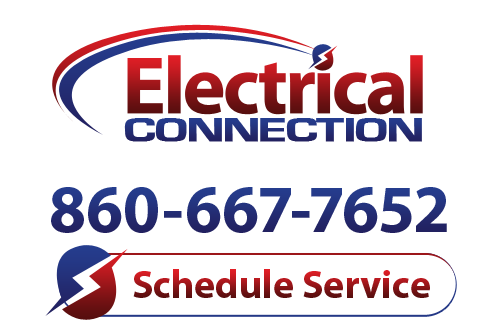 Call today to set up a consultation or ask about our complete line-up of electrical services. Call 860-667-7652 now and let us find solutions for all your electrical needs! If you are looking for a licensed electrician in Hartford, Newington or anywhere in the state of Connecticut then please call 860-667-7652 or complete our online request form.